Can I just say, yet again, that oral surgery is not my favorite pastime? This past Wednesday I had another procedure, a necessary step towards getting my permanent fake teeth installed, that left my mouth sore and achy and bleeding, and just not at all comfy. I will say that I'm incredibly grateful for caring and competent dental professionals and for friends and family willing to help out. And on the bright side, it looks like my new teeth will be in place before the end of the summer and I couldn't be more thrilled about that! On Tuesday evening, the youth went shooting for our mid-week activity. It was originally planned for last month and was rained out at the last minute. Thankfully, the weather cooperated this time. 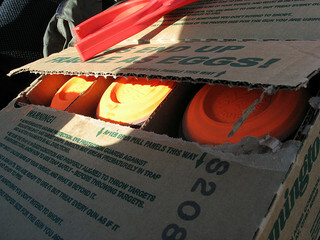 After some firearms safety training, just about all of the youth, young men and young women, took the opportunity to fire both a 20-gauge shotgun and a .22 rifle. Even though it's been a while since I've shot anything, I managed to hit one of the clay pigeons. I was pretty proud of myself. Remember back in May how it was unseasonably warm here in Spokane? Well, now that it's nearing the end of June, it's unseasonably cold. 23 degrees below average! 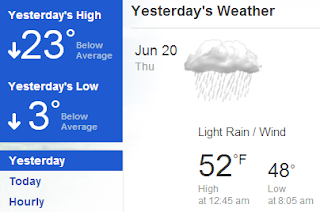 Granted, we need the rain in a big way, so it's hard to be too grouchy about that, but there's something disconcerting about sitting here typing away on my computer towards the end of June in a long-sleeved t-shirt with a big fluffy, hooded sweater over top of it. And our Spokane Indians game Thursday night was rained out. Bummer. Before a child can learn.